On March 2-3, 2018, Uptown Dance Company partners with Houston’s Axiom Quartet for two performances of “Hidden Dimensions,” a program of three new dance works all performed to live music. The performances, which take place at Uptown Dance Centre, feature music from three Phillip Glass String Quartets, the first Cello Suite by Benjamin Britten, and selections from Axiom Quartet’s upcoming debut album (“Axiom – Moments of Truth,” release date April 13, 2018, Parma Recordings). Choreographer Andre Silva, current principal dancer with Texas Ballet Theater, returns to Uptown Dance Company with his newest creation. Mr. Silva’s Hidden Dimensions marks his final installment of a multi-year project, moving towards the creation of an evening length work titled To the moon and back (planned for Uptown Dance Company’s upcoming 20th anniversary season). Mr. Silva’s previous works for the same project (Cosmos, 2015; and Wherever you go there you are, 2016) explore themes of aggression, sensuality, playfulness, and solitude. Mr. Silva says his newest work “combines the past concepts, including: mindfulness within each moment of movement, space in different levels – both ethereal, and those around us – and expression of emotions through movement.” With Hidden Dimensions, Mr. Silva explores a narrative approach to his choreographic process, creating a work that portrays a woman caught in a dream realm. Music from Axiom’s new album inspired Artistic Director Beth Gulledge-Brown’s newest pas de deux, titled At first sight. The musical selections highlight Axiom’s focus on performing varied musical genres, ranging from Haywyre and Monteverdi. Drawing her inspiration recent life events of her dancers, as well as the kinetic energy of the music, Gulledge-Brown describes her work as an example of “art imitating life.” Guest dancer Rupert Edwards also returns, building on his artistic relationship that began with Uptown Dance Company last season. Even in a city as culturally rich as Houston, audiences rarely get the opportunity to hear one of the solo cello suites by Benjamin Britten in live performance. Axiom cellist Patrick Moore first approached Uptown Dance Company in 2015 with the idea of programming Britten’s Cello Suite No. 1, seeking the addition of choreography and lighting alongside his performance to provide multiple pointes of access to listeners. The concept greatly interested choreographer Alex Pandiscio and sparked a collaboration. Through numerous discussions of the musical structure and motifs, Moore and Pandiscio extracted themes in the work that resonated with them both – fate, separation, trauma, love, fear, and triumph. These themes form the basis for the programmatic work, Entanglement. Uptown Dance Company is excited and honored to be part of Big Give Houston 2017, happening on November 28, 2017. Big Give Houston is a 24-hour collaborative fundraiser for nonprofits in and around Houston. BGH celebrates 24 hours of Houstonians coming together to give back to the local organizations that support the community where we live, work and play. You can show your love and support for the art of dance by making a donation to Uptown Dance Company via Big Give Houston. Why should you donate to Uptown Dance Company during Big Give Houston 2017? UDC is trying to raise funds for our Spring 2018 project, Hidden Dimensions with Axiom Quartet. The project features three world-premiere works by Texas Ballet Theater principal dancer Andre Silva, UDC artistic director Beth Gulledg-Brown, and resident choreographer/ballet master Alex Pandiscio. UDC will be dancing to live music performed by Axiom Quartet. Big Give Houston on November 28, 2017 (12:00am – 11:59pm)Bonus: Check with your employer if they have a matching gift program that matches donations you make to non-profit organizations. Big Give Houston is designed to rally the community around the critical missions of local nonprofits. For one day per year it focuses its attention on the amazing missions within the Houston (and surrounding) community and encourage donors to give local. One day out of the year BGH helps strengthen the foundation of our local communities, by providing critical funding for and celebrating the work of our community partners. When is Big Give Houston? Anyone with a credit card or debit card and access to the internet can participate. MasterCard, Visa, Discover and American Express donations received through the website. No donations via check, cash or stock will be accepted. Is my donation tax-deductible? How do I get a copy of my receipt? All donations are fully tax deductible and irrevocable donations to a donor advised fund at The K Foundation, a 501(c)(3) organization which assists with the processing of the donation and forwarding of grant funds on to the nonprofit a donor specifies. The K Foundation will provide an electronic receipt at the time of the donation via email. The e-mail you receive shortly thereafter meet all IRS requirements as a record of donation. If you are asked to provide a paper receipt for IRS purposes, please print out a copy of your email receipt. 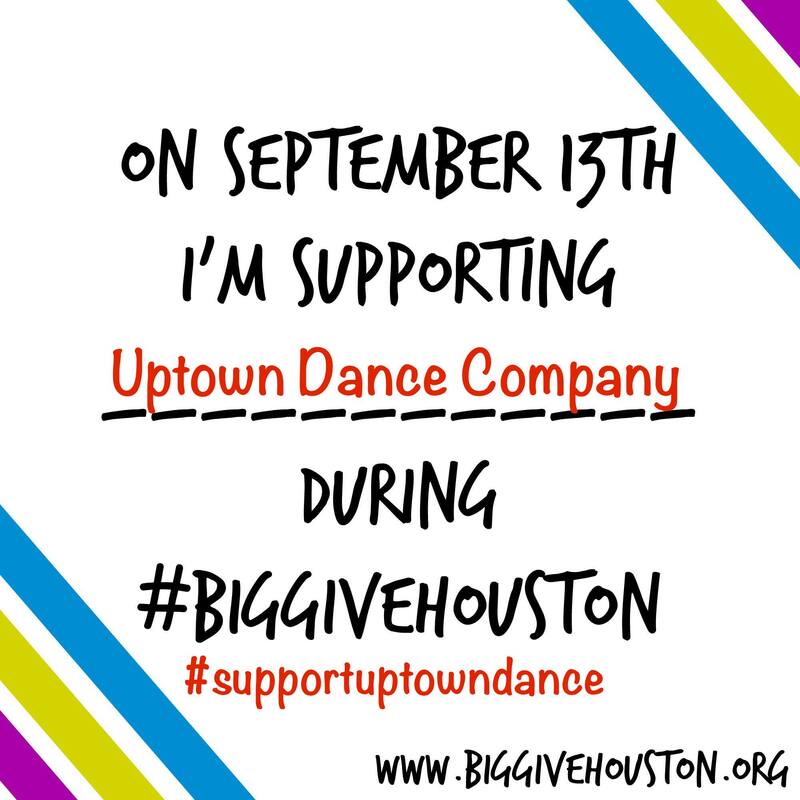 How can I support Uptown Dance Company beyond Big Give Houston?